Easter is a treasured holiday in our household. Some of our favorite crafting memories are the many happy times spent decorating and preparing the house for the big day. 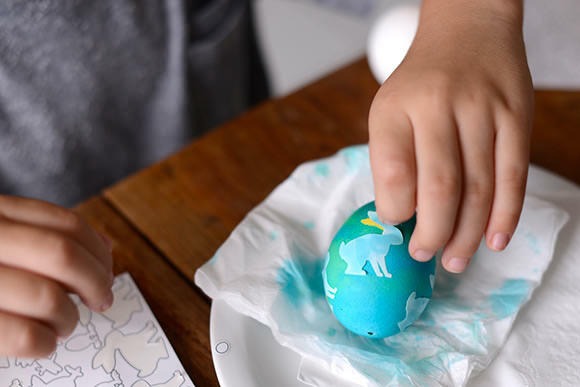 Every year, we love to kick things off by coloring eggs to decorate the breakfast table on Easter morning. 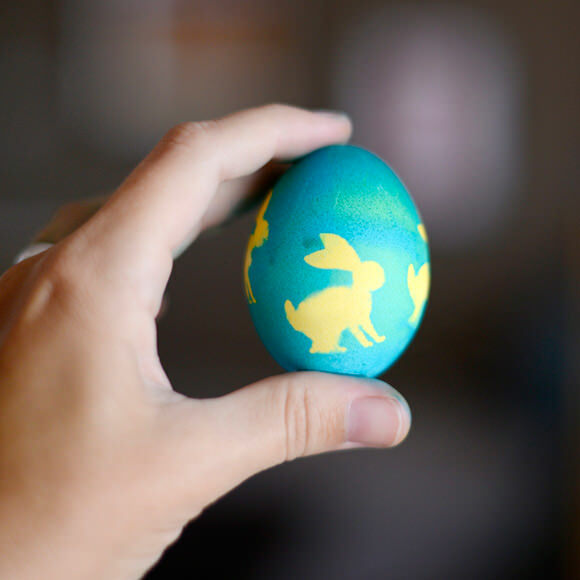 Before getting started, you’ll need to wash the eggs. Now would be the time to blow out the eggs as well, if you wish to do so (optional, not required). 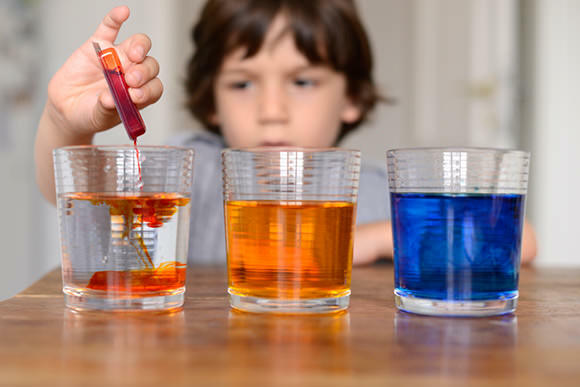 Next, fill a cup with water and slowly add yellow food coloring until you reach the desired color consistency, followed by four tablespoons of vinegar to ensure the color sets. Repeat this process for the blue and red dyes. 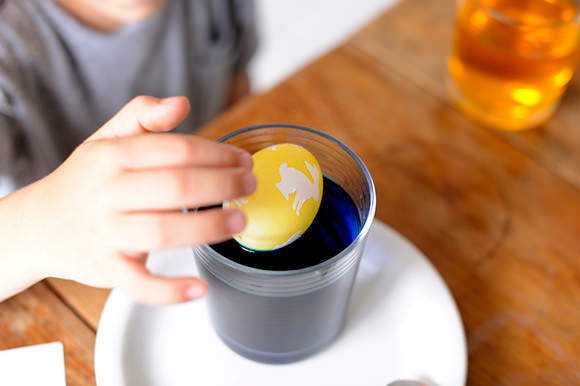 First, immerse the egg in the cup with yellow dye. This will make the silhouettes left behind by the stickers yellow. 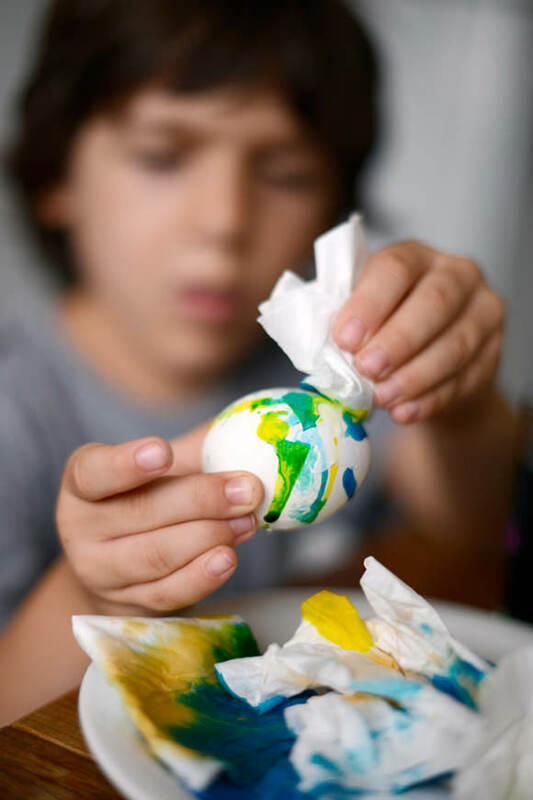 Leave the egg in the yellow dye for about two minutes, and then lay it on a napkin to dry. Once the egg is dry, place the stickers on the surface of the egg. Keep in mind that the stickers need to be small, otherwise the adhesive may not form to the curve of the egg and allow dye to seep through. 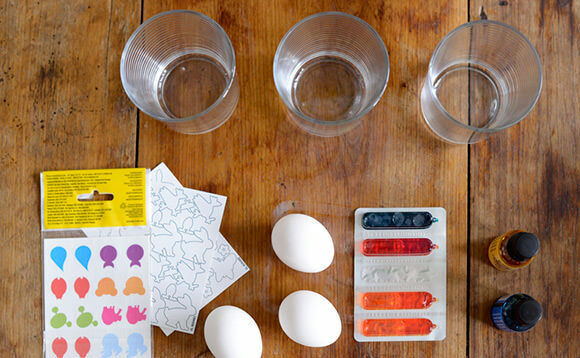 After applying the stickers, place the egg in the cup with blue dye for two minutes. 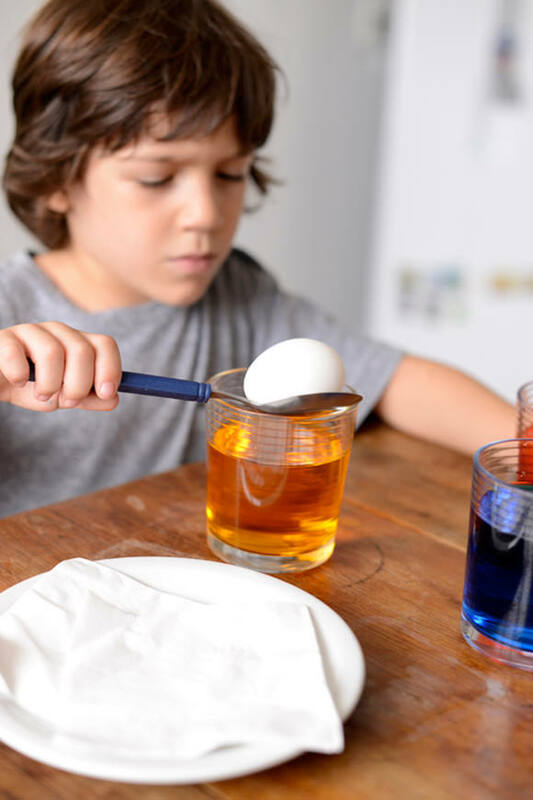 Remove the egg from the blue dye and dry with a napkin. 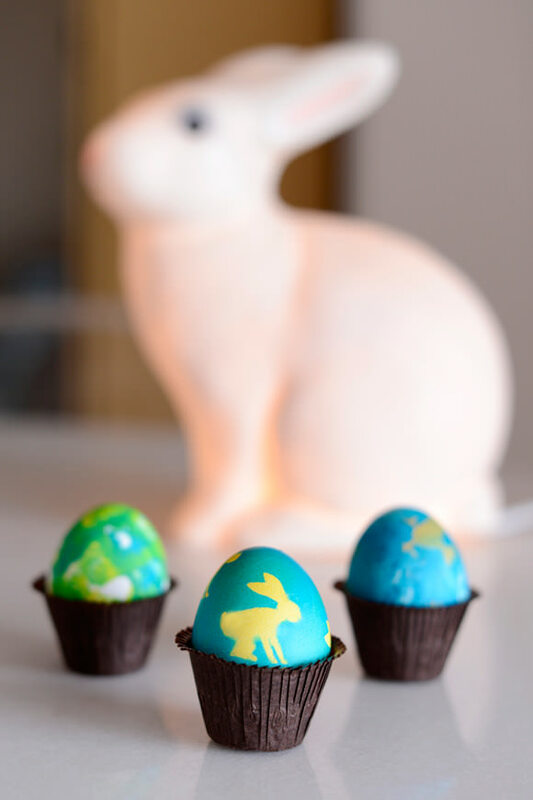 Take off the stickers and admire the lovely new silhouettes on your Easter egg! 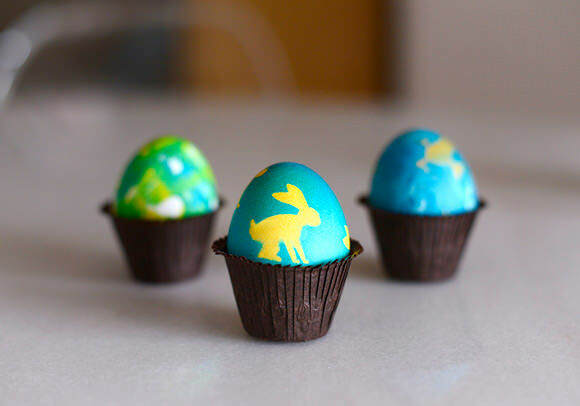 Now it’s time to arrange the freshly decorated eggs on your table for Easter breakfast. We decided to use mini cupcake liners for added decoration. So pretty! 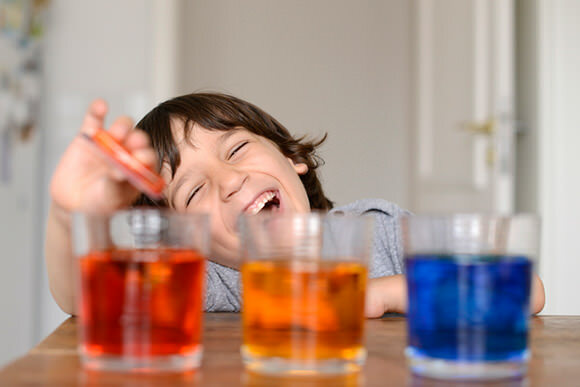 I remember doing something similar when I was younger. Thanks for sharing this, is so simple yet so beautiful, I enjoyed the pictures too, can’t wait for my little one to be old enough to do this together (he is only 15 months!) I Love your blog! I’m definitely putting this on my Pinterest to remember it! Fabulous Idea! I tried it with my almost two year old and wrote about it on my blog, Mama Bee No E. Thanks for the post.